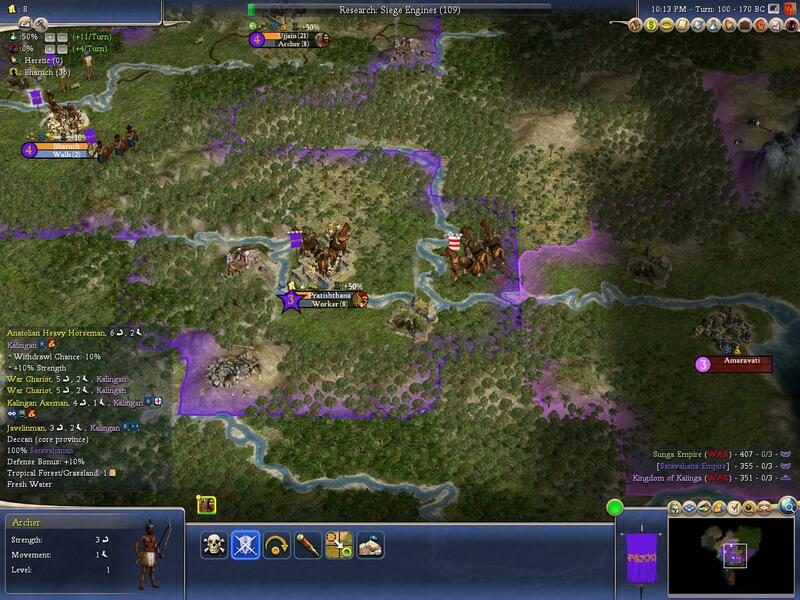 Discussion in 'RFC mod-mod: Classical World' started by srpt, Dec 8, 2011. 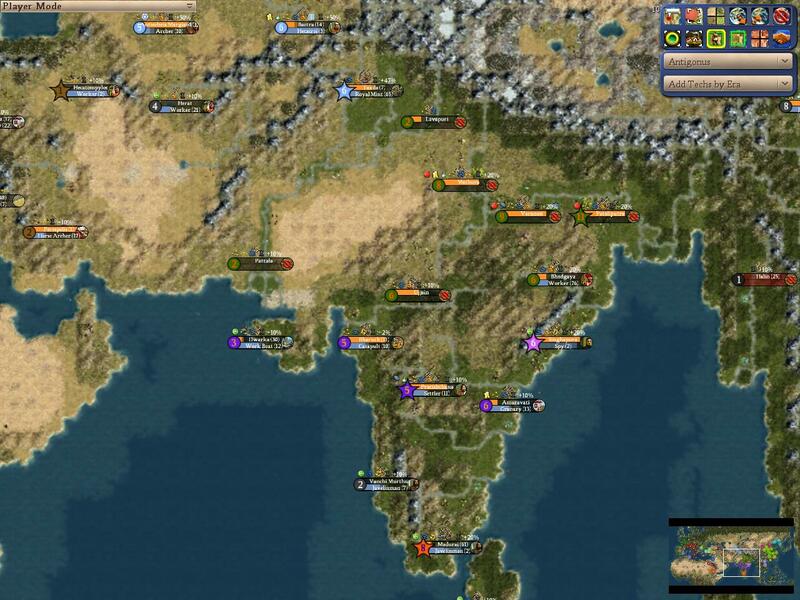 Welcome to RFC Classical World, an RFC mod set in eurasia/north africa in the classical age (300BC-850AD), featuring 44 playable civs including the Ptolemys, Seleucids, Kushans, Parthians, Sassanids, 7 Indian dynasties, 6 Chinese dynasties, Romans, Byzantines, Axumites and even Khazars, Visigoths, Ostrogoths and Vandals. Rise and fall, plague, stability, and mercenaries are all included, as are custom corporations, new religions and historic barbarian spawns. 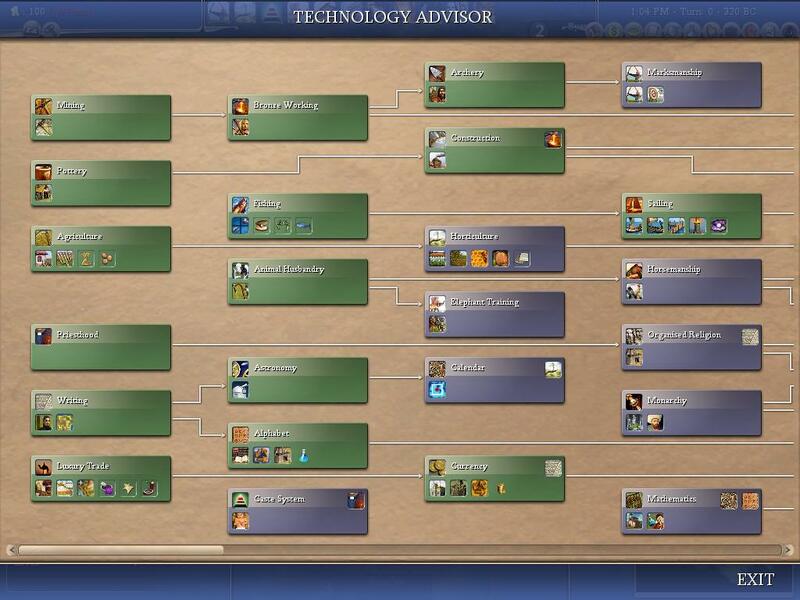 Also new tech tree, civics and units and a few completely new features like an expanded slavery system and some fun new things to do with spies. For those that aren't familiar with Rhye's and Fall mods, they feature dynamic settings in which new civilizations appear at appropriate times and places and also sometimes collapse into civil war and disappear. 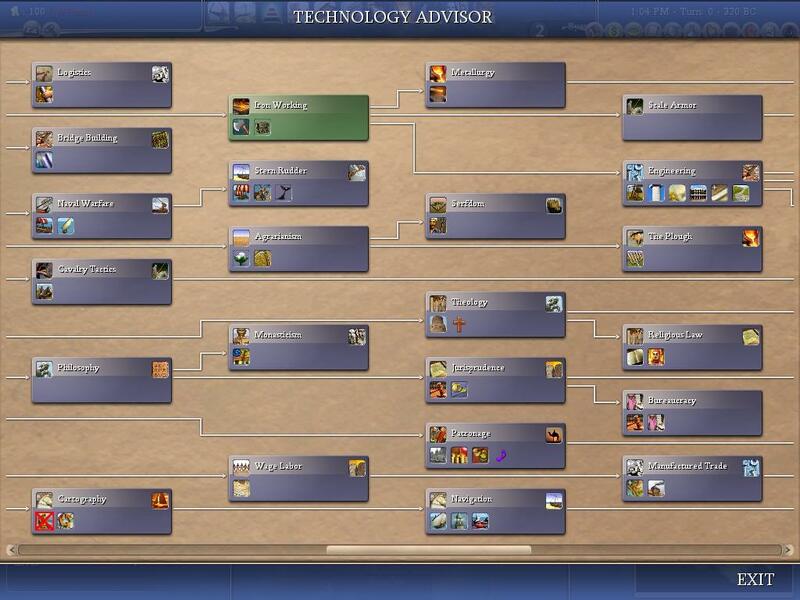 If the human player picks a civilization that is not on the map at the start of the scenario, the AIs play against each other until the the human player's appointed time arrives. The AI is also coded to settle cities in specific historical locations and new cities, both human and AI, are automatically given accurate historical names. The mod is now feature complete, nearly content complete and free of major bugs afaik. 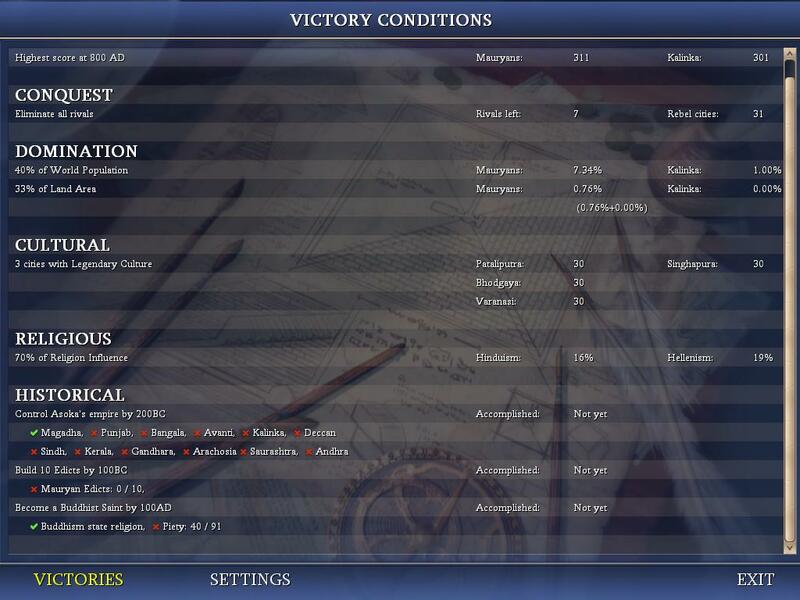 All civs have Unique Historical Victory conditions and all but one have Unique Units, Buildings and Powers. The mod is very stable. We have about half a dozen people involved in testing and there are no mystery crashes. Note that the map is very large though and the initial loading can sometimes take long enough to make you think its frozen and sometimes it will take up to a minute to get past certain auto-play turns, but only occasionally. The mod is available as a regular download or via svn, a system that enables incremental updates to be carried out and distributed without having to re-download the whole mod each time. Its not hard to set up and there is a link below to a post that provides instructions on how to do that. A Byzantine spy hires some Huns to fight for the Empire. 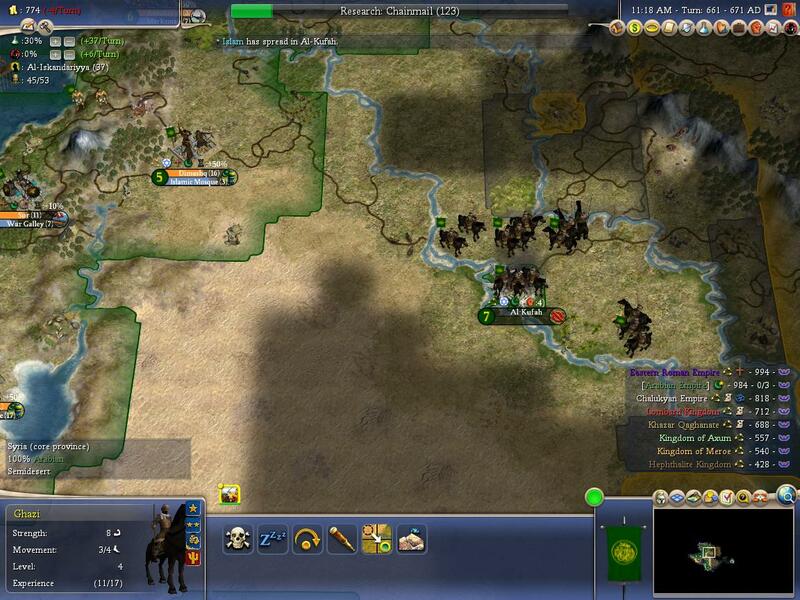 The Antigonids and Seleucids, two of the three successor states of the fragmented empire of Alexander featured in the mod, battle for control of the Levant in the very early game. The Satavahanas, a dynasty that ruled central India in the mid-Classical period, prepare to defend their capital from an invasion by the Kingdom of Kalinka. Armenia wins a Unique Historical Victory, having conquered Syria, been the first civilization to convert to Christianity and having not lost any cities. There are eleven religions, nine already founded and three yet to be founded at the start of the scenario. The unfounded religions can be be founded in the normal way by being the first to discover a specific tech, but they will also appear automatically if no civilization does so before the time when that religion was founded. Christianity is founded in Jerusalem around 30AD, Manichaeism in Babylon around 250-260AD, and Islam appears with the Arab spawn at Mecca in 630AD. With a couple of unique exceptions, the ability to convert to a state religion is not available the early civs when they spawn. 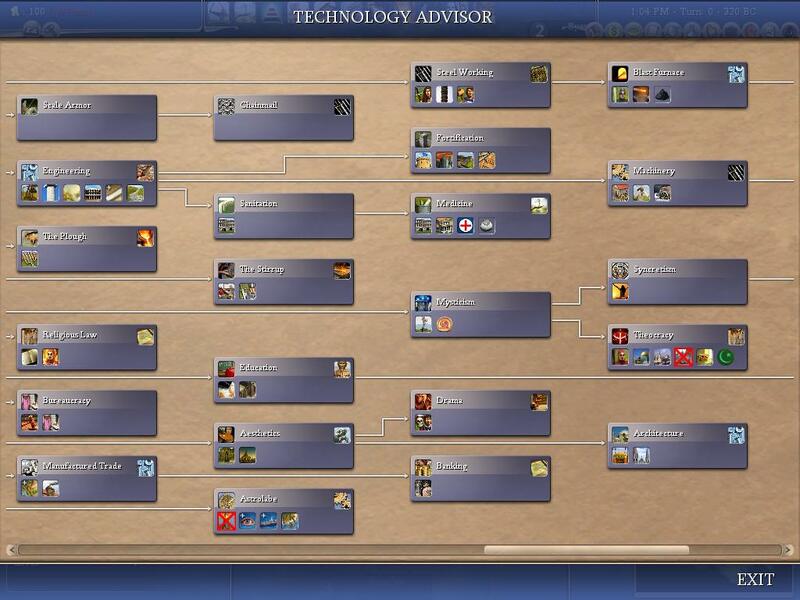 To do so you need a tech called... State Religion, which is two techs away for most starting civs. Conversion also requires the religion to be present in half of your cities. The conditions under which Missionaries can be built has also changed, see "Pilgrims and Scripture resources" below. Specialists are in general more powerful in RFCCW than regular BtS and there are some new specialists. Tile yields are also a bit different. The biggest changes are that citizens (the default specialist) get 2 hammers and 1 coin, and mines are not buildable unless there is a resource present. There are also 3 new specialist types which each require a tech but no building and can be used without limit as to number: the Tax Collector (requires Currency, 4 coins, 1 unhappy face), the Tradesman (requires Engineering, 3 hammers and 1 coin) and the Artisan (requires Metal Casting, 2 hammers, 2 culture and 1 coin). None of these new specialists generate any Great People Points. Roads are only used for movement and are not necessary to connect resources. This is done for the speed increase it brings to the game. Also, cottages cannot be built adjacent to cities or other cottages. Some technologies are not tradeable. This generally reflects their nature as phenomena/practices that need to embraced or engaged with by large sections of society and at the same time slows overall progress through specific tech paths. 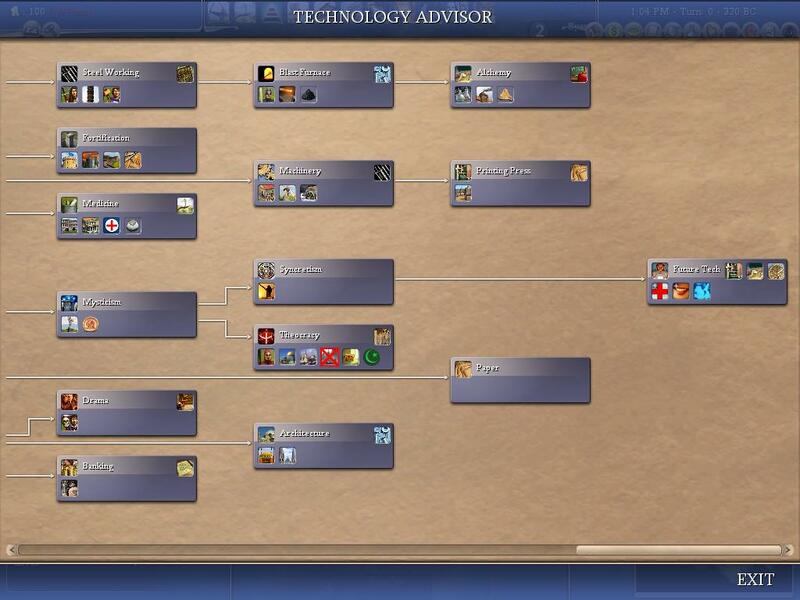 The techs involved are of two types: civic/society type techs and the archery/horse achery line, reasoning as follows. Archery, horsemanship and especially horse archery were skills highly challenging skills that needed to be learned by a significant portion of the population and actively maintained in order for those societies to produce effective military formations of those types. An idea like Caste System needs to be ingrained in the entirety of society, accepted by everyone, in order to become something efficient and productive enough to be represented in the game as a bonus, which it is. When running the Slavery civic, you can enslave defeated enemy units. Slaves can be used 4 ways. They can work as workers (at 75% work rate), be sacrificed in one of your cities to rush a building, be sold for gold in another civ's city, or be settled in one of your cities for +2 prod, -1 food. When you switch out of slavery all your slaves, settled or not, disappear. This is done by a spy on the same tile as the barbs and only works within your cultural borders and if you have currency. 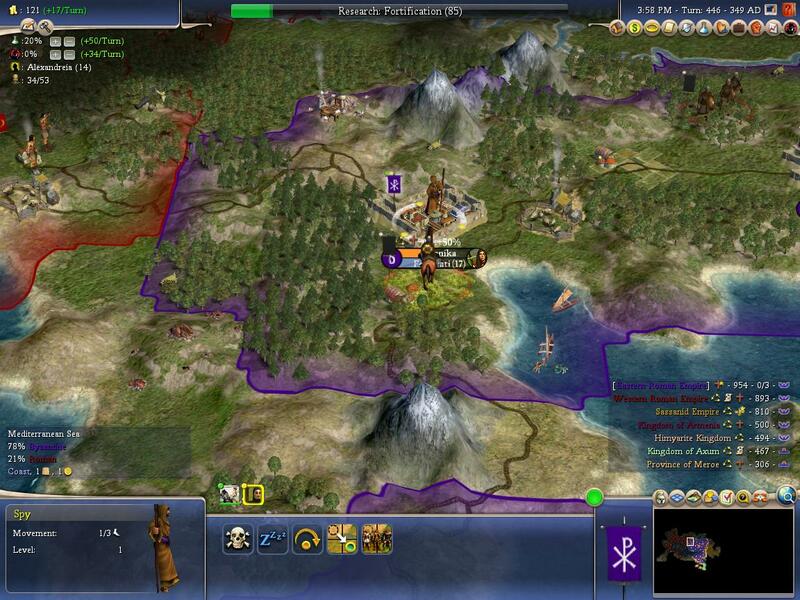 Barbs can be bribed to leave your lands for 10 gold per unit. Barbs can also be hired as mercenaries if you have enough gold. The buttons for each action will appear if you have enough gold. In both cases there is a 20% chance the barbs will steal your gold and kill your spy. For sea barbarians, you get a popup when they enter your waters if you have enough gold to at least bribe them, if you're rich enough to hire them, you get a popup with the extra option. Again the 20% chance of failure applies. The Pilgrim is a new unit for acquiring and spreading religions. The Scriptures are new resources produced by buildings, like Hit Movies or Singles in regular BtS. The Pilgrim can become a missionary of a particular religion in the Holy city of that Religion, so with this unit you don't have wait for a religion to spread to you randomly, you can go out and get it. Missionaries can be built if you fulfil any 1 of the following 3 conditions: you have a monastery in the city, you have the proper state religion, you have the proper religion resource. The Scripture resource also gives 1 more happy face from Temples and Cathedrals of the same religion. The resource is produced, 3 at a time, by the Shrine of the religion and 2 at a time by the Academy. Spies can be used to vassalize AI civs or to vassalize the human player to the AI. To do this you must be at war and must send a spy to the enemy capital. Certain conditions must be met. To vassilize an AI civ you must have 4 times as many cities as them and have an army adjacent to their capital which outnumbers the cities defenders 3 to 1. To capitulate to the AI they must have 3 times as many cities as you. When the vassalization occurs all war/peace conditions of the vassal change to match the master. Roads are not necessary to connect resources. This is done for game speed. 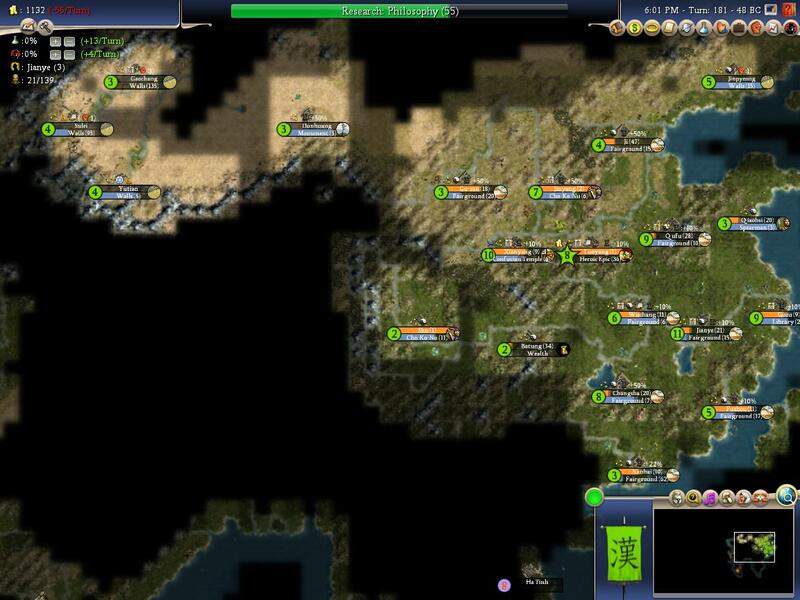 Most unit movement is doubled but some terrain (woodland, forest jungle) takes 3 movement. 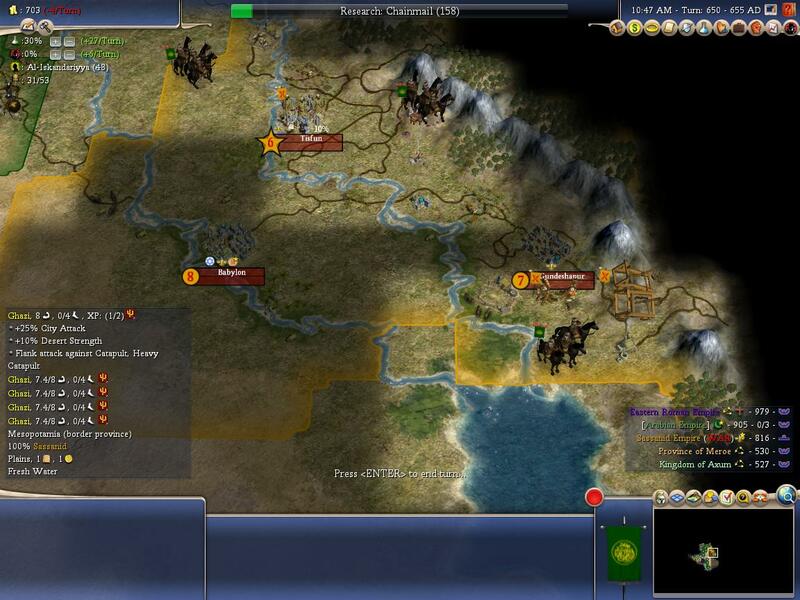 Antigonids: the Armenians are the first civ to spawn with Monarchy, in 180BC. Egypt: for the Mediterranean ports goal, any port on the Mediterranean in Greece, Thrace, Anatolia, Syria, Judea, Egypt, Libya, Cyprus or Crete counts. Mauryans: for the 10 Edicts goal you get credit for each Edict as it is built and do not lose credit for it if you lose the city later. Byzantines: to steal silkworms, send a spy or great spy to a silk plantation. 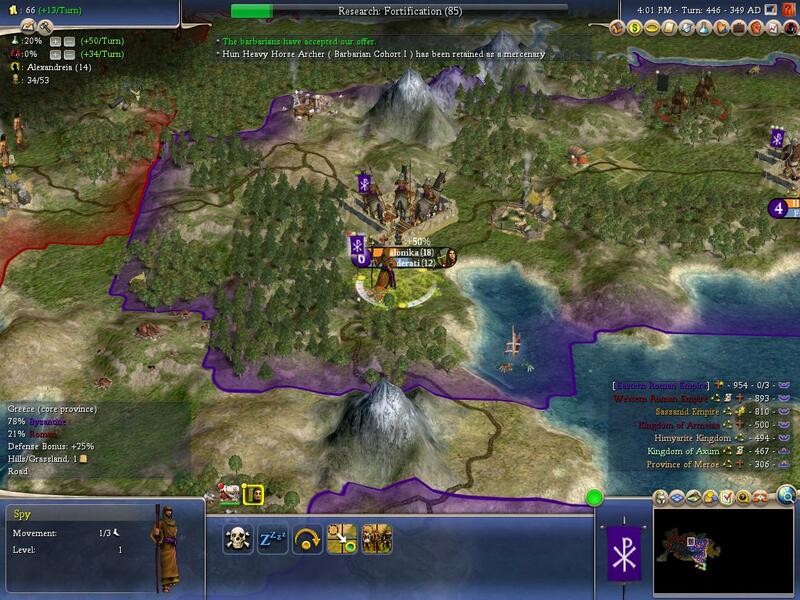 in the event of war between human Rome and AI Carthage, whoever declares it, Hannibal spawns in northern Italy. in the event of war between Rome and human Celts or Carthage, if Rome has few or no defenders in or near Rome, they get some. The system works on three concepts: Stablility Levels, Stability Checks and Crises. 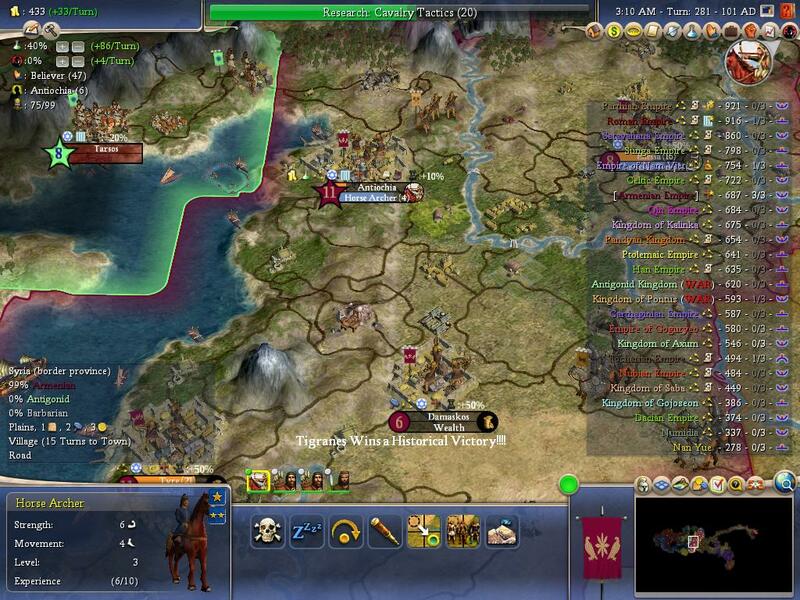 There are three stability levels, Stable, Unstable and Collapsing, indicated by the usual symbols next to the civs name and score in the main screen. All playable civs start at stable. There is no stability score associated with these levels, all the game knows is whether you are stable, unstable or collapsing. In certain circumstances as the game prgresses, Stability Checks can occur. 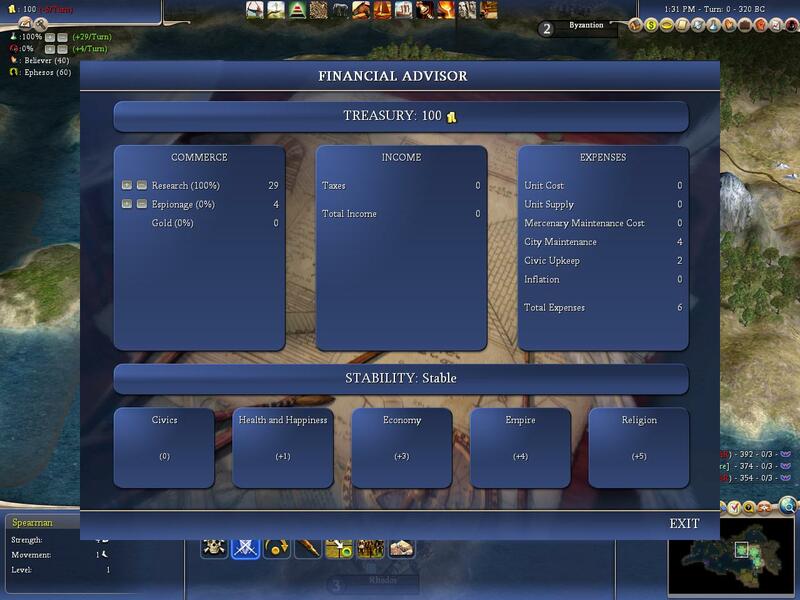 A Stability Check takes a snapshot of your empire, observes various qualities and calculates a stability score. Depending on this score, your Stbility Level may go up or down and you may experience a Crisis. There are 2 kinds of Stability Checks, neutral ones and positive ones. Neutral ones can raise or lower your stability level and cause a crisis, positive ones can only raise your stablilty level or have no effect. 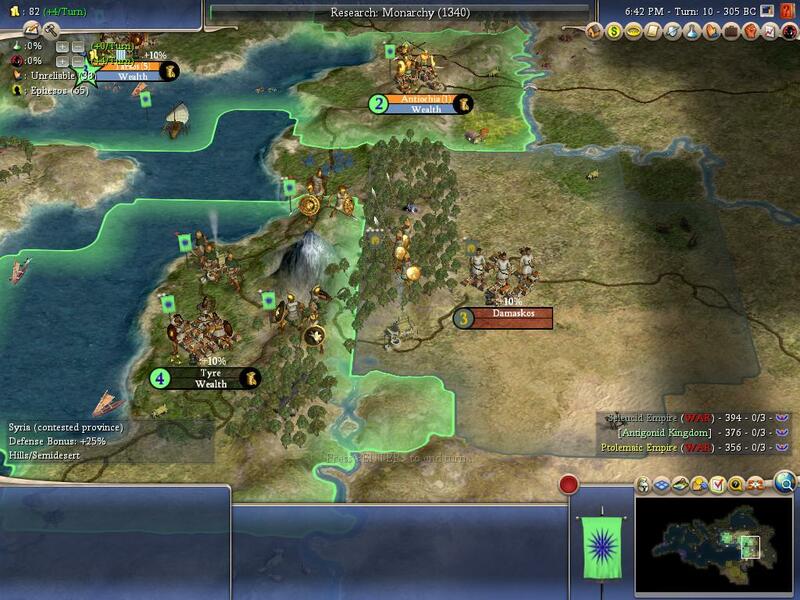 there are no stability checks for a civ in the first 40 turns after its birth. there are no stability checks during anarchy except the check that occurs at the start of the revolution. 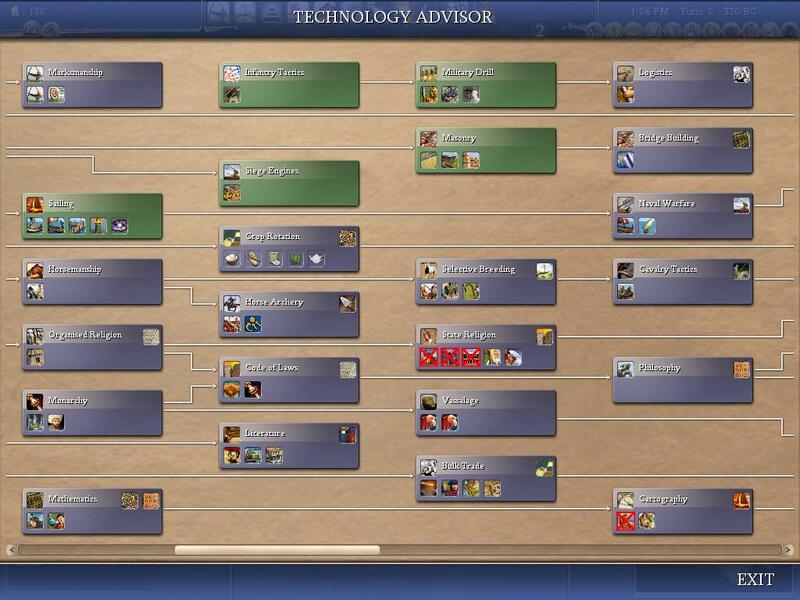 there are no stability checks during a golden age and golden ages reset your stability level to Stable. The following factors influence the Stablility Check: civics, religion, economy, health and happiness, and the population of your empire's core vs it's periphery, mitigated by certain factors. 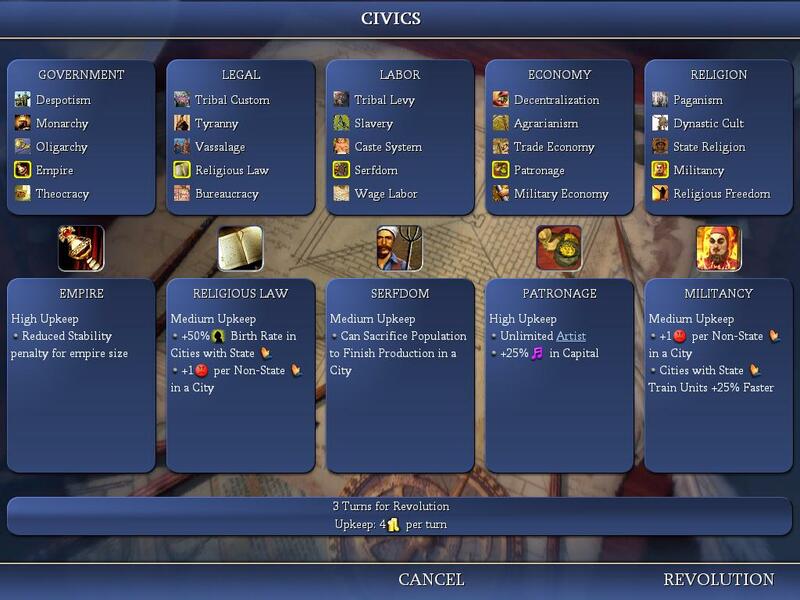 The civics section is roughly the same as before, there are good combinations and bad ones. There are also penalties for running Caste System while not Hindu or running Slavery while Christian. The religion calculation counts the number of non-state religions in your cities and, if you have a state religion, the number of your cities that do not have it. If you are running Caste System Hinduism does not count as a foreign religion. You also get bonuses and penalties from high or low piety*. The health and happiness calcualtion counts all the happy, unhappy, healthy and unhealthy faces in your empire, divided by the number of cities. The effect on stability is minor compred to the other factors. The empire core vs periphery works as follows: all the cities population in your core provinces is multiplied by 4 to get the core population number, the population of any cities in your normal regions is left as is if you are running the empire civic (or the theocracy civic with the state religion present) and the bureaucracy civic and have a courthouse in the city, but multiplied by 1 + 1 for each of the preceding conditions that does not apply. So for example if you were running empire but not bureaucracy and had no courthouses the periphery population would be multiplied by 3. Cities outside of your normal regions receive additional penalties. If the core population number is higher, stability is affected positively and if the periphery is higher stability is affected negatively. So the rule of thumb is that without favorable civics or buildings you can carry an empire population equal to the population of your core with no ill effects. There is also a heavy penalty for losing control of any of your core provinces. The economy calcualtion is very simple and only looks at 1 factor: can you save gold and progress in research at the same time ie if you are not earning gold at zero tech you are in trouble. Two things can result from a stability check: your Stability Level can be adjusted and you may experience a crisis. If the check is positive then your stability can only go up and you will not experience a crisis. There are four levels of crisis: minor, moderate, severe and terminal. Their effects range from anarchy and revolts in cities to complete collapse. All crises cause at least a couple of turns of anarchy and once you are in anarchy you are immune to further Stability Checks until it is over. The Romans are so big and important that they get two sets of UHVs: one representing the Republic and one representing the Empire. 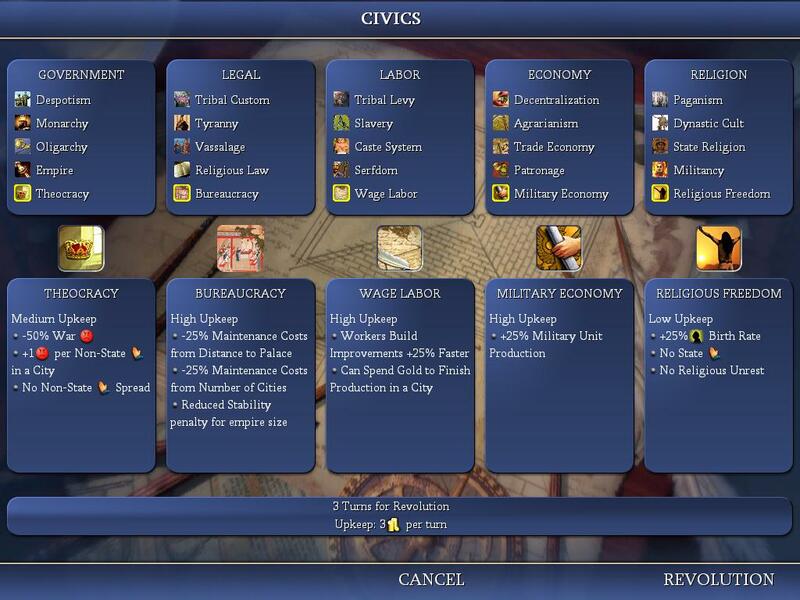 Just as the Romans spawn, the player gets a popup asking which set of goals he or she would like to pursue. The Jin are the dynasty that came out on top after the famous "Three Kingdoms" period in China. To add more possibilities to this era, the human player can start out as any of the three kingdoms and pursue the unification of China and the other goals from there. and this is a checklist we are using to keep track of which Unique Historical Victories are checking properly and are possible but challenging. anyone else getting that error? I've never seen that one. I didn't see that one either. Then again, I'm not on the SVN. theres no SVN. I'm working out a couple of bugs relating to mercenary hiring and then I'll put a new version with better leaderheads and some more UUs on GameFront. thanks for the support. I should have a new version up later today with proper leaderheads, some wonders, more barbs and more UUs. still can't figure out why the starting civs can't hire mercenaries. 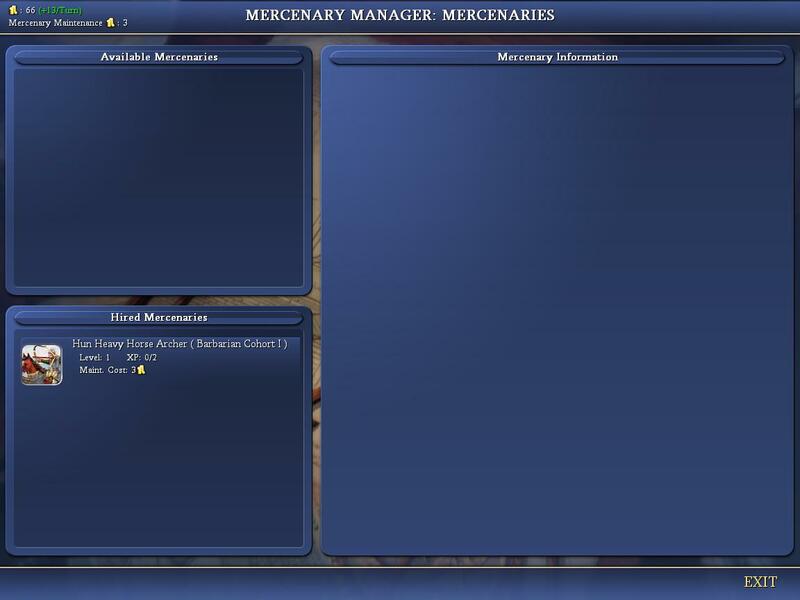 the mercenary hiring bug is solved, the leaderheads are better, more barbs and riseandfall works. no wonders yet. please let me know if you have any problems or have any ideas for the mod. thanks. I'm happy that 11 people have downloaded this. Thank you for the interest. I will post a new version soon, probably this weekend. 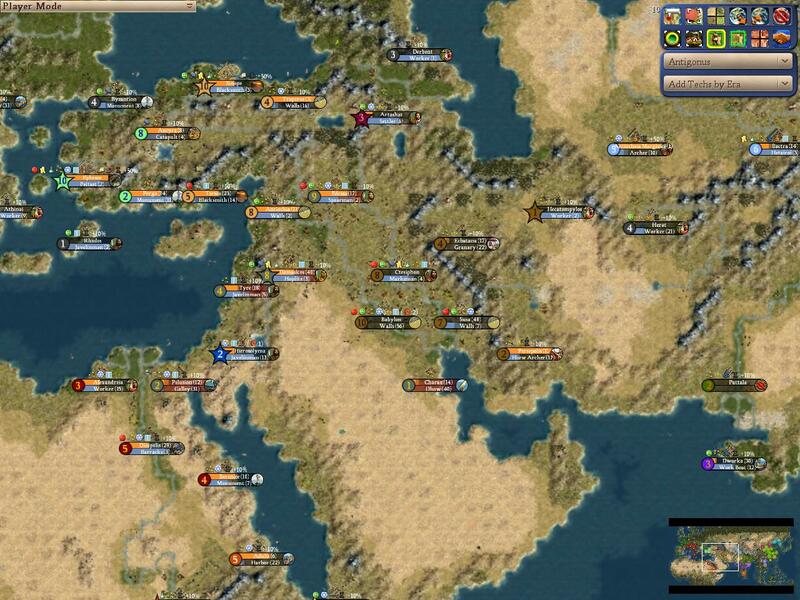 I have made better settle maps (in the posted version all civs share 1 map), added some wonders (both already built and buildable), more barbs in different regions and some more unique units. I will put the new version up when I have at least UUs and UBs for the all civs I intend to be playable, which is about 2/3s of them. Many thanks to embryodead for his help. Major changes I'm planning or considering are: make the Jin respawn of the Han and the Chalukyans a respawn of the Satavahas, then add the Jouan Jouan or Gokturks and Kanem. Also formalize the "small trading civs" thing (Saba, Ghana), modding their AI to always trade resources for money (or in some cases specific deals, like salt-for-gold across the shahara). I'm also trying to figure a way to allow medditerranean civs to trade for tin and amber in the north sea and baltic, if necessary by adding small trading civs there. I have 2 weeks off for Christmas starting tomorrow and 90% of my family are safely 1000s of miles away so I'm hoping to get a lot done in this time. But is it normal that there are very much things that are purple,which means the art is missing. Some leaders have a name that reads:TXT_LEADER_LEADER,or something like that. Leader name is "Ghana" and civ name is "Ghana Empire". But maybe because this project is in development. 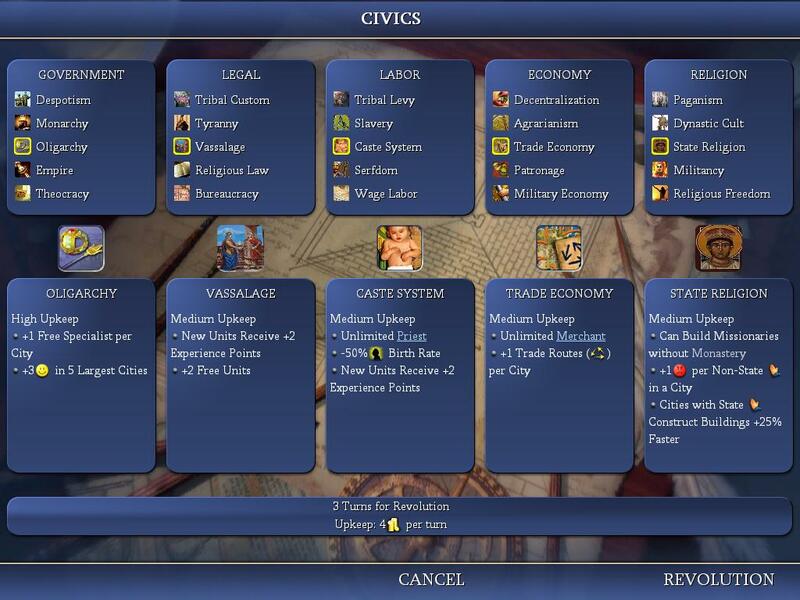 Some civs have no leader art which causes the game to crash when I try to select them in the scenario. Samaratungga has the wrong button,I attached the correct button here. DOWN WITH GANDHI! ANNOYING RUNNING GAG IS ANNOYING! INDIA STRONG, REMOVE PACIFISM! I like where this mod is going and I'd love to see the finished product but I have a few ideas. *For Rome make the third UHV Constantinople OR Rome, but make it very hard to keep Rome. If Rome manages to keep the Empire intact they will lose the 3rd UHV due to Rome being stronger than Constantinople. *Change the name of Greco-Baktria to just Baktria. I doubt they called themselves that and it's a little wordy. Their UHV's are fine but I don't think it represents their immense wealth enough. Perhaps change it to "Amass 5,000 gold by 29 AD" or "Be the weathiest civ in 29 AD". *Sassanids founding Islam is a bit odd, perhaps make their third UHV "Spread state religion to x%" or something like that. Zoroastrian or Islam would be nice candidates. *Gupta Longbowman can be named "Patiyodha" or just Longbowmen. Yuezhi Riders can be called "Baexdzhyn" or just "Riders". A city attack bonus would fit them. *I'm not too sure about the Baktrian UU. There's a few choices here for a famous unit of theirs but a peasant isn't really what comes to mind for me. I usually think of "Hetairoi Kataphraktoi" or Companion Cataphracts. 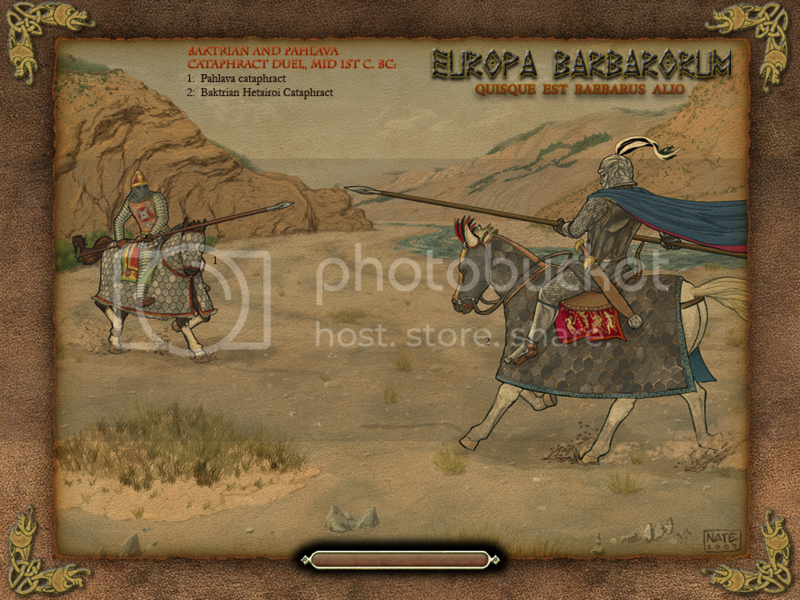 http://europabarbarorum.com/factions_baktria_units.html Tis a good page for inspiration, heck that entire site is your time period. I think my suggested UU's would get a strength bonus of 2(possibly with a building cost penalty) or something similar. *Same for the Ptolemys. I think something like a Galatian Mercenary fits better. They were Celtic mercenaries who were famous in the Egyptian army at the time, the Ptolemys even settled them into the Fayum(sic?) in such numbers that even today people in that area are paler than others in Egypt. It would be an Infantry unit with a bonus against melee and horse units. For UP's I have a few ideas, don't know if you have any planned but here I go. 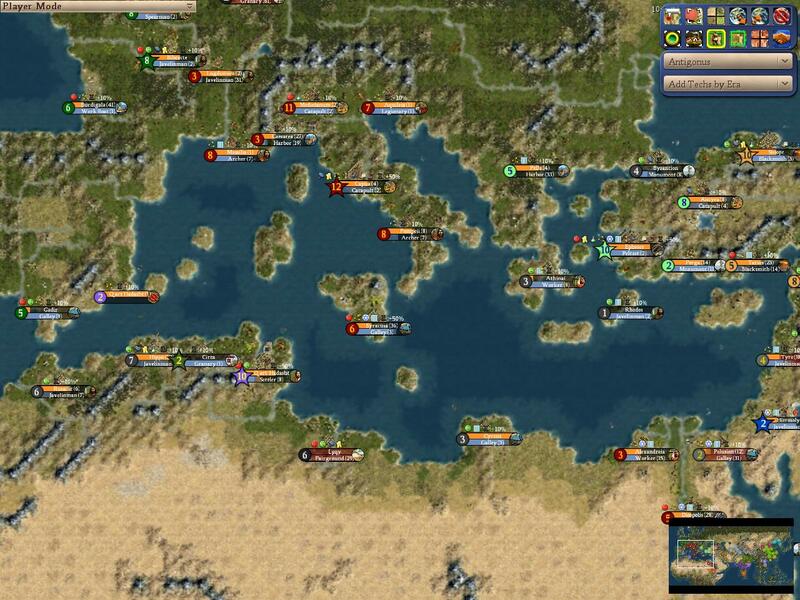 Rome ax Romana: +1 Stability for cities out of core area. Rome: my idea was to make the 3rd Roman UHV about Constatinople, like making it the biggest and most cultural city in the world in 700AD or so, making it a good strategy for the human player to move his capital there, but have the first UHV be about Rome so it doesn't happen too early. The middle UHV would be the empire. Bactria: yeah I just said Greco-Bactria for clarity's sake. That wealth UHV sounds great. I was going to give them the religious tolerance UP. Sassanids: yeah I don't know why I wrote the founding Islam thing. Gupta and Kushan UUs: thank you for those names, they're in. Bactrian UU: totally fictional, I made it up. I couldn't find any info on their armies and I wanted them to have a horse archer counter. Ptolemaic UU: I just grabbed something convenient. Your idea is probably better. Can you give me some details/suggestions on the Galatians? All your UP ideas are good and I had some of the same ones planned. I guess you didn't know all civs can pass boats through forts? as long as they're in your culture you can. There is a pre-placed fort at the canal spot to ensure mediterranean contact with the indian ocean. thanks for making the Sarmatungga LH, he's great, and thanks for the button. for the art, copy the 2 pakked art files from SoI. hopefully that will fix the crash too. yes I have some text to finish. thanks again for the interest, more coming soon. Galatians were used as mercenaries by all the Diadochoi, but none used them as extensivly as did the Ptolemaioi. The Ptolemaioi imported Galatai and other Keltoi and gave them land and peasants in the Fayuum depression and other areas in return for their services as reliable heavy infantry. Their equipment reflects their position and wealth within the Aigyptian forces. They are armored in good quality mail and wear light linen shirts and trousers. 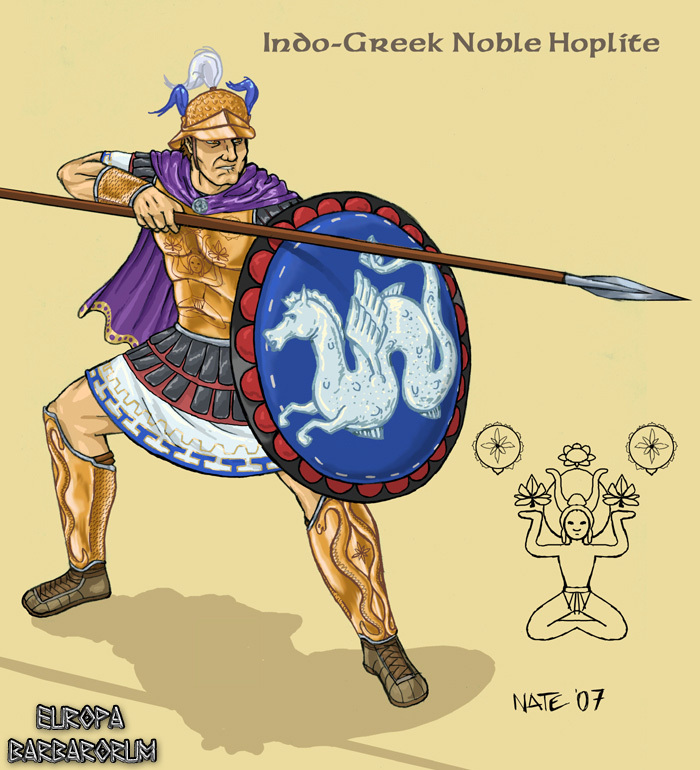 They were given bronze Attic-style Hellene helmets in place of their old equipment, and took to these rather well. They have excellent morale and discipline, since their whole purpose in life (other than turning a profit on their estates) is the service of the Ptolemaios kingdom in war. They should be used as a heavy infantry force in keeping with the knowledge that they outmatch most other eastern heavy infantry. They are impetuous but well trained and capable of keeping good order, their only serious weakness is cavalry. Historically, Galatai were imported in such numbers as to have changed the ethnic makeup of some parts of the country. They often intermarried with the Hellenes and to this day the area around the Fayuum depression in Aigyptos is populated by fair skinned people with light eye colors. The Galatians were fanatically loyal to the Ptolemaioi, being used as a counterweight to the dangerous native troops, which they slaughtered wholesale during two rebellions. After the Roman conquest, these men joined the legions raised in Aigyptos, and spread themselves all over the near east. Cleopatra's own Celtic bodyguard was given to King Herod the Great by Octavian following her death. Theirs is a truly fascinating story that is not often told. Considering their excellent training they should have some sort of withdrawal bonus maybe? High Withdrawal+Higher City Attack is a great combo. Having no access to many of the Hetairoi of Alexander from which the other Successors formed their heavy cavalry arm, the Baktrians decided to include both Iranians and Greeks in a new force of Hetairoi, supported by the type of huge estates that were required to comfortably arm such a force. Their massive horses are fully barded with iron lamellar. The riders of these horses wear iron plate reinforced with mail at the joints and lamellar leggings. Their helmets were of a Thracian type, but with a face mask made to look like a roaring lion. They carry the xyston and ride with all the prowess of the steppe peoples from which many are descended. In addition, they are armed with a long kopis as well, which is a common weapon in the lands of Baktria and gives an armor smashing punch to these already deadly cavalry. As can be surmised, they are exceedingly expensive, but are probably the heaviest cavalry that can be found on the battlefield. They are so massively armored that they neednt fear anything but bristling walls of spear points, arrows meaning nothing to their thick iron. 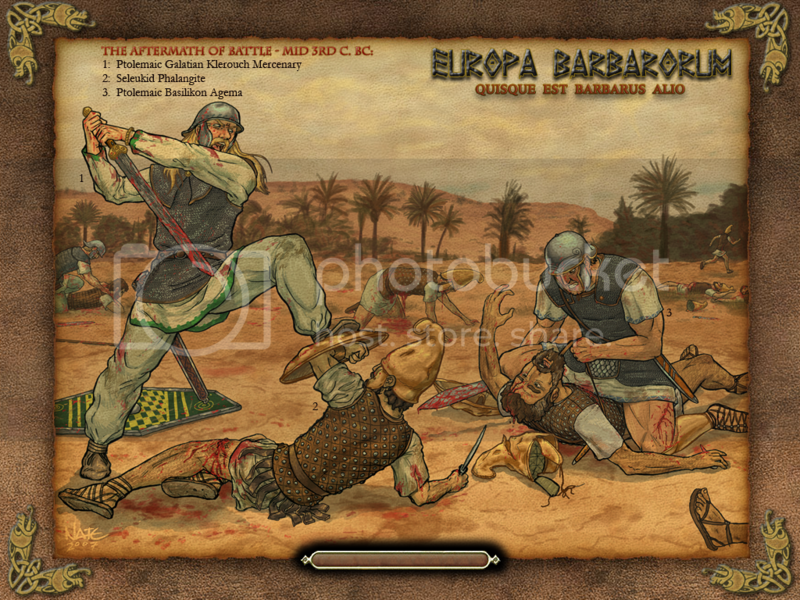 For their non unique unit skins I find Europa Barabarorum to be a great unit source for you as they have historically accurate representations for the era. You can get a lot of influence for their units from http://europabarbarorum.com/factions_saka_units.html as the Saka were their immediate predecessors. Dunno if they used Cataphracts but they probably did as Central asia is where Cataphracts came from. For the Ptolemys, Seleucids, Romans, and others you want represented you can ask your skinners to draw inspiration from http://europabarbarorum.com/factions.html that list. It also has full histories on each civilization in that mod, though of course in it's present state only a few of them will be represented unless you decide to focus solely on that area. http://i285.photobucket.com/albums/ll80/ArchePersis/loading_screen_33.png Galatikoi and Ptolemy Heavy Infantry. wow thanks for all that. I have never played that game or that mod but those guys did some great research. I have never made units myself so for the time being I will use the best I can find from others' work. In the long run I'm totally into making all the units as accurate and detailed as possible, so all help is appreciated. Right now I'm focused on getting all the content/mechanics in and working and keeping it stable. I've had some success (and some confusion too) with the debug dll and found a couple of things that were causing crashes during autoplay, so I think I can get back to adding content. You can hardly manage to host all the files with attachment in civfanatics. I recommend Sourceforge, where i have no problems with size constraints, and you get an SVN repository as well, if you need it later. Rhye's and Fall of Asia - Live and change 4500 years of Asian history! 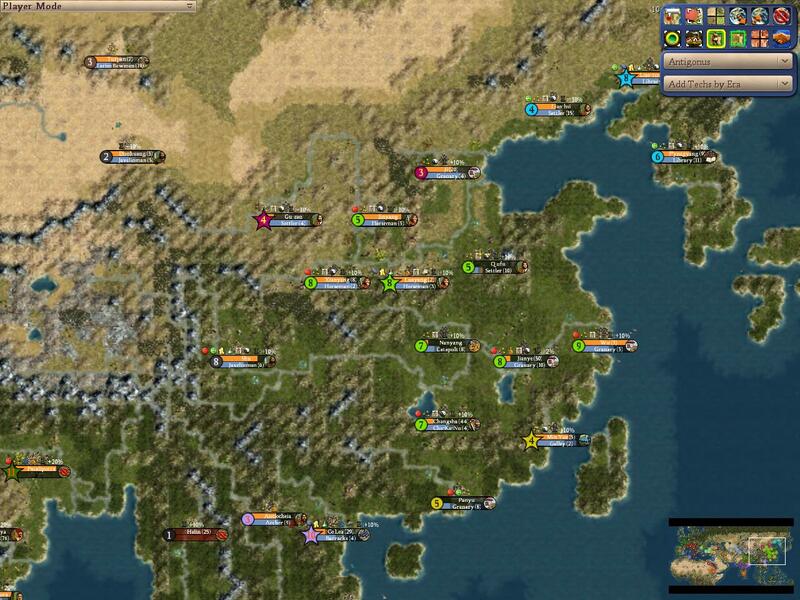 Conquer India with the Indo-Greeks, prosper as Sri Vijaya and build the greatest Empire there ever been with Han China. v1.3 has been released. Get your copy before someone else does it! Ooh look at that beautiful Celtic one. didn't get much done on UUs but fixed a bunch of little things, added leaderheads and lots of barbs. 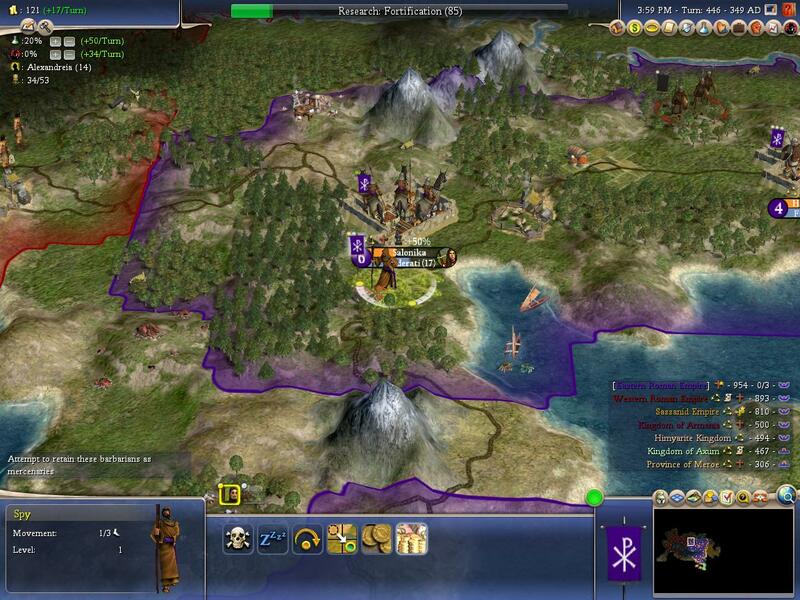 the early civs are probably the best to try. edit: those barbs are a bit tough, these are more balanced I think.